... and helped world markets kick off the fourth quarter of the year in a positive vein, overcoming lingering concerns about Italian politics and a slowdown in Chinese manufacturing over the weekend. Last on Sunday, the US and Canada said in an official statement that they have reached a trade deal with Mexico in an agreement dubbed the USMCA (US-Mexico-Canada Agreement). US President Trump is to sign the new trade agreement by the end of November, which will then get passed on to Congress. Canada agreed to eliminate the "Class 7" milk protein pricing system and increase US access to Canada's dairy market beyond Trans-Pacific partnership levels. The New trade deal does not make major changes to current Chapter 19 trade dispute settlement mechanism which gives the three countries the right to challenge each other’s anti-dumping and countervailing duty decisions in front of an expert panel with members from both countries involved in a dispute. US said the trade deal with Canada does not affect US steel and aluminium tariffs currently levied on Canada, and that these tariffs are separate to the trilateral deal. A Senior Trump Administration official said if Trump imposes auto tariffs, both Mexico and Canada will be accommodated in "side letters". The deal was the latest "feather in the cap" for U.S. trade negotiator Robert Lighthizer, who has advocated a tough line towards China, compared with Treasury Secretary Steven Mnuchin. The news sent the Canadian dollar up 0.65% against the dollar to a four-month high while the Mexican peso hit its highest in over seven weeks. The breakthrough also supported global equity markets, with European stocks climbing as havens including the yen and gold fell. The Stoxx Europe 600 Index rose for the fourth day in the last five, led by technology and chemicals companies, ignoring the latest political noise in Italy, where an unconfirmed report in the media suggested that the EU would reject Italy's 2.4% budget deficit proposal in November and open a procedure against the country’s public accounts which extended the selloff in Italian bonds from last week. EU Commissioner Dombrovskis said what emerges so far from discussions in Italy does not seem to be in line with EU fiscal rules, he added it's important to stick to responsible fiscal policy to keep interest rates low. The Dutch PM has also expressed his concerns over the Italian budget plan. Meanwhile, Italy's Finance Minister Tria is attempting to head off a confrontation between the EU and Italy that by insisting that the country will reduce public debt despite its plans to increase spending. The euro was initially hit by worries about Italy's fiscal deficit, dropping below the $1.16 mark having lost 1.2 percent last week and off three-month high of $1.18155 touched a week ago; however it since rebounded and was trading virtually unchanged, just above 1.16 at last check. Investors will also be closely watching the market impact from the latest ECB tapering: the central bank will cut its monthly bond purchases in half to €15 billion starting this month, with a full phase out expected by year end. However the euro edged up, shrugging off data showing growth in euro-area factory output slid to the weakest pace in two years, on the back of renewed dollar weaknss. 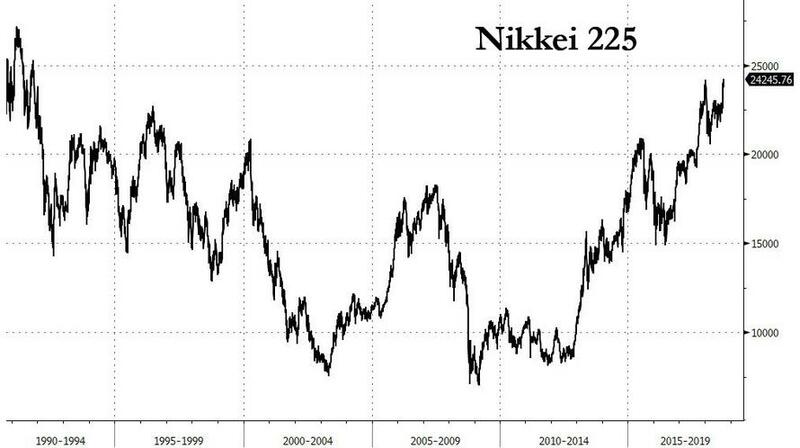 With China, Australia and Hong Kong out on vacation, attention focused on Japan where the Nikkei 225 Average closed at its highest level in nearly 27 years amid muted trading as much of Asia was on holiday. Also casting a shadow were two surveys on Sunday that showed growth in Chinese manufacturing sputtered in September as domestic and export demand softened. As a result, the MSCI’s index of Asia-Pacific shares outside Japan fell 0.25 percent. In rates, Treasury 10-year yields advanced to 3.09%, wiping out all the TSY gains since last week's Fed meeting. Investors will also be keenly focused on Tesla after Elon Musk’s agreement with U.S. regulators; the shares soared 16% in pre-market after Musk agreed to resign as chairman for three years and pay a fine, he would however keep his job as CEO. Oil prices held their gains, with international benchmark Brent briefly hitting a four-year high, as U.S. sanctions on Tehran squeezed Iranian crude exports, tightening supply even as other key exporters increased production. Brent crude futures rose 0.6% to as high as $83.25 per barrel, the highest since November 2014, before trading flat on the day at $82.72. In the latest Brexit news, UK PM May said the Chequers plan is not dead, while added she is prepared to listen to EU counter-proposals but she wants to hear the details of EU’s concerns, and EU leaders want a deal just as she does. She said she believes Chequers will not destroy the single market and a Canada-style deal is not on the table for EU. In the interview, she refused to answer whether a no-deal Brexit will mean a hard border in Ireland. Note: BBC’s Andrew Marr noted a no-deal under WTO would result in a hard border. May, in a Sunday Times interview, told Tory rebels to “stop playing politics” and the only proposal on the table at the moment that delivers, is the Chequers plan, while she reiterated that no deal is better than a bad deal but she thought a good deal could be reached. She also challenged the EU to come forward with a counter proposal. Meanwhile, former UK Foreign Secretary Boris Johnson has refused to rule out a leadership challenge to UK PM May. Furthermore, in an interview with The Sunday Times, Johnson questioned whether UK PM May believes in Brexit and branded her Chequers plan “deranged”. Russian Foreign Affairs Minister Lavrov said everything possible will be done to preserve Iran nuclear deal. Expected data includes manufacturing PMI and construction spending. Cal-Maine and Stitch Fix are among companies reporting earnings. Asian stocks traded mixed following a rather uneventful lead from Wall St. on Friday where major bourses ended the day little changed as markets wrapped up a strong quarter where the S&P showed it best quarterly gain since Q4 2013. ASX 200 (-0.6%) underperformed amid a slowdown in China’s manufacturing sector shown by the Caixin data, while Nikkei 225 (+0.5%) was buoyed on currency effect in a continued weakness of the JPY following a downbeat Tankan release and Manufacturing PMI. Elsewhere, Hong Kong and Mainland China are closed today due to public holidays. Indonesia’s island Sulawesi was hit by a 7.5 magnitude earthquake, which triggered a 6m (20ft) tsunami that hit the cities of Palu and Donggala. Officials have confirmed the death toll rose to over 800. European equities have started the day on the front foot, with the FTSE the laggard, as a slightly bid GBP is weighing on the index. The consumer discretionary sector is the marked underperformer as RyanAir (-8.7%) cutting guidance due to lower than expected Q2 and Q3 traffic has hit European airline stocks, with all of Air France (-2.5%), EasyJet (-3.0%) and Lufthansa (-1.0%) in the red. Linde (+1.2%) is leading the gains in Germany and has supported the DAX to near the top of the index pile after receiving antitrust approval from China for their Praxair merger. The FTSE MIB is the outperforming index as Italian stocks are seeing some reprieve from last week’s sell off. Index heavyweight Telecom Italia (-1.5%) are, however, in the red after a broker downgrade at Barclays. In FX, the Loonie has leapt to the top of the G10 leader board, and aside from testing resistance round 1.2800 vs its US counterpart that Cad is bid and outperforming right across the board. The clear catalyst is a somewhat unexpected pre-‘deadline’ deal between the US and Canada on a new style NAFTA deal that will include Mexico and be renamed as USMCA. Looking at technicals, if Usd/Cad breaches 1.2800 and remains below multi-month chart support around 1.2813-19, that includes a 50% Fib, nearest or next downside targets are seen circa 1.2730, 1.2685 and even 1.2500, while from a more fundamental perspective comments from BoC’s Lane later may impact. JPY/CHF - The clear underperformers, as Usd/Jpy continues to break higher and just climbed above 114.00 following dips in Japan’s Q3 Tankan survey and September manufacturing PMI, while Usd/Chf remains within 0.9845-00 parameters in wake of a less robust Swiss manufacturing PMI that overshadowed a recovery in retail sales. EUR/NZD/AUD - All relatively flat or narrowly mixed vs the Greenback, with the single currency pivoting 1.1600 amidst somewhat divergent Eurozone manufacturing PMIs and reports suggesting that the EU will register its objection to Italy’s proposed 2.4% 2019 budget (in November, according to sources). Note also, the spill-over from SOMA may well weigh on the headline pair at some stage. EM - The Peso and Lira are heading the regional pack, with Usd/Mxn testing bids around 18.5000 on the aforementioned NAFTA breakthrough to include all 3 countries in a new pact, while Usd/Try has made a more convincing break below the 6.0000 handle as healthy or at least encouraging Turkish trade data offset a disappointing manufacturing PMI (former boosted by exports vs latter deeper in sub-50 territory). In commodities, the oil market is uneventful this morning and seeing a lack of newsflow for the fossil fuel, with Brent essentially unchanged for the day and hanging just below the USD 83.00 handle after last week’s rise to over 4 year highs. A senior Iranian Oil Official said they have no plans to reduce oil production. 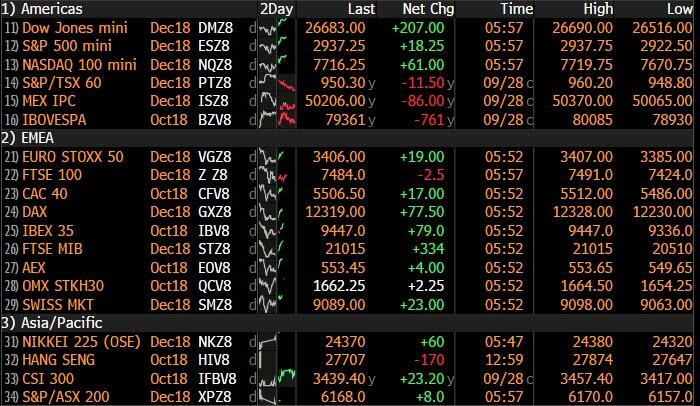 Most metals are in the red this morning with zinc and copper down by over 1% and gold down by 0.5% as the week-long holiday in China is hitting demand. It's a busy start to the week for data on Monday. The main focus should be the final September manufacturing PMI revisions in Japan, Europe - with a first look at the data for the periphery - and the US. Also due is the August unemployment rate for the euro area and money and credit aggregates data for the UK, while in the US we'll also get the September ISM manufacturing and September vehicle sales data. The final September PMI revisions around the world will also be closely watched. Today sees the final manufacturing revisions - including of course a first look at the periphery in Europe where Italy in particular is expected to show little improvement from the 50.1 reading in August - while the final services and composite revisions will be seen on Wednesday. Away from that today sees the September ISM manufacturing in the US. In China we had the September PMIs released over the weekend with the main story being weakness in the manufacturing sector. Indeed both the official (50.8 vs. 51.2 expected) and Caixin manufacturing readings (50.0 vs. 50.5 expected) fell more than expected last month, indicative perhaps of fallout from the trade war. There was better news from the non-manufacturing sector however (54.9 vs. 54.0 expected). Meanwhile the UK Conservative party conference kicked off yesterday. In a BBC interview yesterday morning PM May indicated that the Chequers plan is still her offer with regards to a Brexit deal. Today sees Brexit Secretary Dominic Raab and Chancellor Philip Hammond speak. Wednesday sees PM May close out the event. Our economists expect May to take a hard line on Brexit to keep the rank and file happy. Overnight the main news is that of a deal struck between the US and Canada to a NAFTA replacement which includes Mexico. The new deal, which is expected to be signed by the end of November, is to be called the US-Mexico-Canada agreement, or USMCA. The deal includes ground-breaking intellectual property provisions, new provisions in unfair trade practices, new market access for dairy producers and stronger labour provisions. 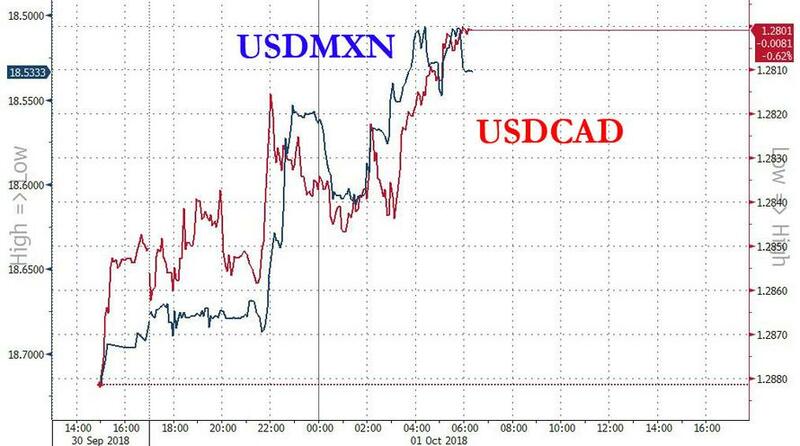 Unsurprisingly the Mexican Peso (+0.65%) and Canadian Dollar (+0.51%) are the big early movers in FX markets while US equity futures are up +0.50%. With China out trading volumes are thinner than usual and the rest of markets in Asia are more mixed (Nikkei +0.43%, Kospi -0.27%). Back to last week and the Italian budget dominated market attention on Friday. There wasn’t much fresh newsflow on Friday and over the weekend aside from some verbal sparring including comments from Central Bank Governor Visco warning about the need to reduce Italy’s debt burden. The new additional info early on Friday was that the 2.4% deficit would be for each of the next three years although Cabinet Undersecretary Giorgetti did tell La Republica over the weekend that there could be some flexibility in that. BTPs reacted reasonably rationally in that our strategists model based on twin deficits suggested that a 2.4% deficit should increase spreads by 15-35bps on Friday. They closed 25.7bps higher but were nearly 40bps higher by late morning. It was still the biggest move and widest range since the May selloff. Two-year yields rose 24.7bps and were around 40bps at the highs for the day. Perhaps confirmation that Tria is staying helped settle the market down in the afternoon. Tria reiterated his plans to stay over the weekend and did say that debt should fall one percentage point over each of the next 3 years. However this is based on his growth forecasts of 1.6% and 1.7% in 2019 and 2020. To put this into some perspective DB’s forecasts for Italian growth in 2019 has been 0.9%. Mark Wall suggests that if normal fiscal multipliers apply then Italy could get a 0.5% boost but with crowding out due to higher yields it will likely be less. He also made the point that there’s no sign of any structural reforms that would increase growth. So it’s unlikely that debt will fall. Back to Friday and Bunds rallied on the risk-off flows, with 10-year yields falling 5.8bps, the most since May. Italian equities also underperformed sharply, with the FTSEMIB shedding -3.72% versus the Euro Stoxx 600’s -0.83% fall. European banks led declines (-3.92%), and Italian banks in particular had a terrible day (-7.26%), their worst since the post-Brexit carnage of June 2016. Looking ahead over the next weeks and months, the reactions to the Italian budget from the European Commission and from ratings agencies will be key. The Commission has the power to request budget changes and can impose sanctions in the event of noncompliance, and the Economic Affairs Commissioner Pierre Moscovici has already signaled that the current plan looks like it is “out of line with our rules.” The three major ratings agencies all place Italy two notches above speculative-grade, and there are risks of downgrades next month. After the Fed hike week 10yr Treasury yields ended the week close to flat (+0.9bps Friday), though the 2s10s curve flattened back to within 5.6bps of its cyclical low. The dollar rallied +0.97% on the week, with most gains coming against the euro, as the single currency sold off at the end of the week around the Italy headlines (-0.32% Friday). Emerging market currencies gained +0.52% last week with the Turkish Lira (+3.83%) and Russian Ruble (+1.35%) outperforming, while Argentine Peso shed -9.89% to reach its weakest-ever level versus the dollar. While European equities uniformly retreated amid the Italy drama (Stoxx 600 -0.83% Friday, -0.29% on week), other global bourses were more mixed. The S&P 500 and DOW retreated -0.54% and -1.07%, respectively over the 5 days, while the tech-heavy NASDAQ advanced +0.74%. The latter was on track for even higher gains before Facebook shed -2.59% on Friday after news broke that a security issue had compromised data on some 50 million Facebook users. Equities in Asia mostly advanced on the week with the Nikkei and Shanghai Composite gaining +1.05% and +0.85%, respectively. Brent Crude oil advanced +4.97% to its highest level since 2014, closing above $82 per barrel. After Thursday’s bumper German CPI, the euro area aggregate CPI missed expectations on Friday, with the core reading falling to 0.9% yoy versus expectations for 1.1%. So, some inflation softness in the periphery of the euro area. Core US PCE inflation modestly missed expectations for August on Friday at 0.0% mom, though the yoy figure stayed steady at the Fed’s target of 2.0%. It's a busy start to the week for data on Monday. The main focus should be the final September manufacturing PMI revisions in Japan, Europe - with a first look at the data for the periphery - and the US. Also due is the August unemployment rate for the euro area and money and credit aggregates data for the UK, while in the US we'll also get the September ISM manufacturing and September vehicle sales data. Away from that the BoE's Tenreyro and Fed's Bostic, Kashkari and Rosengren will all be speaking at various times. Worth noting also is that Monday marks the final day of debate at the UN General Assembly, while euro area finance ministers will also meet in Luxembourg to discuss 'national automatic stabilisers'.